Russell Brand has unveiled his full 15-minute interview with Ed Miliband, filmed in the comedian-come-activist's kitchen in his London flat. The Labour leader tells Brand that change is brought about by a "combination of politics and people." "Without the politics, without Government, the change doesn't happen," he adds int he interview, filmed on Monday night. "That's what happens in democratic society." Posted on Brand's YouTube channel The Trews, the comedian begins by telling Mr Miliband that the right to vote has become meaningless since women's suffrage. At the end of the exchange, Brand says: "It's not a perfect interview but personally I found it a very interesting experience. "I think it says a lot about Ed Miliband, he understands the way the media works right now, the way the country feels at the moment, the way that people feel, that he was prepared to come round here and talk to us." Ed Miliband has defended his interview with Russell Brand, describing the comedian - who argues in favour of not voting in the general election - as "interesting". He told ITV's This Morning that while people may find his meeting with Brand "controversial," he wanted to take the argument about voting directly to the comedian. "The reason I've done it is because I think there are lots of people who are not going to vote in this election, who think it doesn't matter, who think who you vote for doesn't matter," Mr Miliband said. A trailer for Russell Brand's interview with Labour leader Ed Miliband has been released today. The clip, described as 'Milibrand', on Brand's 'The Trews' YouTube channel shows the comedian quizzing the Labour leader on the level of corporate taxes. "Of course people share your outrage about companies that don't pay their taxes and it can be dealt with," Miliband said. "But you've got to have a government that's willing to say 'there's something wrong with this'". The interview is thought to have been filmed yesterday after a fuzzy picture of Miliband leaving Brand's east London home emerged on Twitter at around 10pm. Ed Miliband declined to say whether he had persuaded comedian Russell Brand to vote in this year's General Election during their meeting late last night. When asked whether the comedian would vote on May 7 by 5 News political editor Andy Bell, the Labour leader said: "You'll have to wait and see." I think Russell Brand and anyone who thinks they shouldn't vote was wrong, and I'll engage with him and anyone else who doesn't think we should vote. Miliband said that meeting with Brand, who in 2013 said that he had never voted, made the election campaign "more interesting" despite Conservative leader David Cameron criticising the move as a "joke". The Prime Minister's jibe appeared to prompt Brand to tweet "Don't be jealous, Dave. 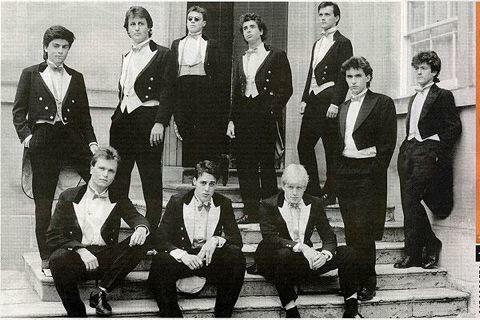 I'll run into you at West Ham - when you're not busy with ordinary people" alongside a picture of Cameron in his Bullingdon Club days. A fuzzy picture of Miliband leaving Brand's east London home emerged on Twitter at around 10pm yesterday. Ed Miliband has said he is "proud to be engaging" with Russell Brand in this election. Speaking at a campaign event in Cardiff, the Labour leader said that "politics is being played in an increasingly empty stadium", adding: "if we don't engage in different ways with people that aren't engaging in this election, then we will have fewer and fewer people engaging". Mr Miliband met with Mr Brand last night, when he recorded an interview at the comedian's house for his YouTube channel "The Trews". The Prime Minister has labelled Russell Brand "a joke" - and taunted Ed Miliband after a photo of the Labour leader outside the comedian's house surfaced on social media last night. A spokesperson for Mr Miliband said that he had been there to film an interview with Mr Brand. But the PM teased both men on the stump today, saying that "his whole view" is "don't vote - it only encourages them". He added: "That's funny, but politics and elections... that's not a joke. Russell Brand's a joke".